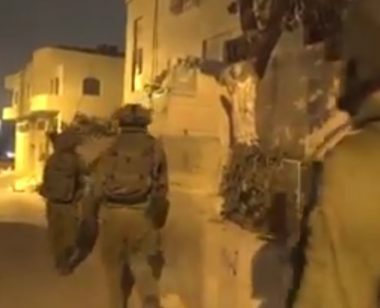 The Palestinian Prisoners Society (PPS) has reported that Israeli soldiers abducted, on Thursday at dawn, at least fourteen Palestinians, including former political prisoners, during violent searches of homes, in several parts of the occupied West Bank. The PPS stated that the soldiers abducted Ahmad Kamal Abu Alia, Ramzi Abu Alia, Madi Suleiman Atiyya, Yacoub Abdul-Razeq Falna, Jihad Ata Falna and Yazan Jad Mansour, from Ramallah governorate, in central West Bank. It said the abducted Palestinians are from the towns of al-Mughayyir, Kafr Ni’ma and Safa. In Hebron governorate, in the southern part of the West Bank, the soldiers abducted Lu’ay No’man as-Sa’da, his brother Mahmoud, Noureddin Salhab, Eyad Naji al-Atrash and Hamza Badawi. In Jenin, in northern West Bank, the soldiers abducted Ashraf Salah Turkman and Mahmoud Murad as-Sa’adi. The soldiers also shot three children and a young man with live fire, before local medics rushed them to Khalil Suleiman governmental hospital in Jenin, suffering moderate wounds. They have been identified as Majd Mahmoud Abu Na’sa, 15, Qais Ibrahim Betawi, 14, Yousef Mahmoud Badawiyya, 17, and Amin Hussein Bani Gharra, 19. Furthermore, the soldiers abducted Mohammad Abdul-Latif Abu Hamsha, 21, from Shweika town, in the northern West Bank governorate of Tulkarem. It is worth mentioning that undercover soldiers abducted a young Palestinian man near Barta’a military roadblock, southwest of Jenin.